Correct me if i am wrong, reading his headstone tells me that he was a Shochet not a Rov. Is says, he was Oisek Bimleches hakodesh while dedicating time to learn too. What does Shin Vav ” Bais stand for? I found him listed in the board of Ezras Torah as Rev. Binyamin Antel New Haven, it was not uncommon that A Shochet officiated at weddings etc. in the absence of an official rabbi or so. I was told that “Rev” usually refers to a Shochet, not a Rov – is that true? 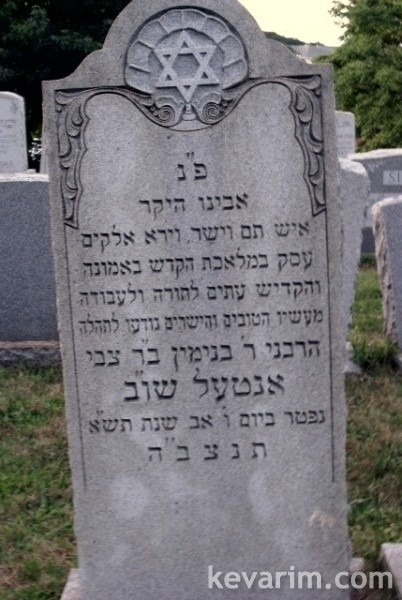 look up Rev Judah barit, buried in bayside – would you say he wasn’t a Rov but a shochet? On the flip side – Rev Joseph Selig Weissman, also a Baysider was a major rav. Perhaps a Shochet was always called rev, while a rav was sometimes called rev as well. Back to us, being listed as Rev. Only confirms that he was a shochet, leave alone that his title Shu”v says so. Rev / Rabbi, back then it was all the same thing. In addition 9 times out of ten the Rabbi of the congregation especially outside of New York City was a one stop shop. He delivered sermons, officiated at wedding and funerals, shoichet, mohel, and was the general halachic authority.